In 1946, I was a 12 year old scout in the 14th Toronto Swansee troop run by Tommy Allen. My father had been involved in scouting for his entire life and our old family photo albums are full of scouting pictures at camps all over Ontario. Before the Second World War my father worked for the Canadian National Exhibition. When war broke out the Exhibition closed and he went to work for the Government. 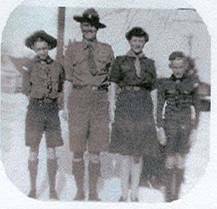 After the war he became a professional Scouter for the Toronto Boy Scout Association in charge of camp and camping along with various other duties. 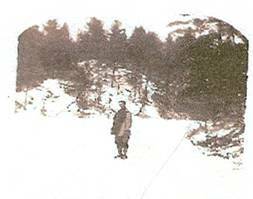 In 1946, he and the late Fred Buesnel (59-62) looked at several locations for a wilderness camp. Included in these locations was Indian Point on Balsam Lake at Coboconk. The camp committee and J. C., as he was known to most, decided that Indian Point was not suitable, as it was too open, had only a few trees, since it was mostly cow pasture, and the lake could become choppy on windy days. On a visit to a real estate office in Minden, he found four thousand acres of forest and lakes for sale north of Haliburton. He proceeded to go on to Haliburton and find the lumber camp. After finding Nelson Webster, the manager of Mill Valley Lumber, and seeing Kennabi Lake he returned to the office in Minden and left a down payment, with his own money, to hold the property. During that fall some members of the camp committee went to Haliburton to look at the property. One of the committee members was Fred Hurst. He fell in love with the property and pushed forward for it’s purchase in the winter of that year. Along with the four thousand acres belonging to Mill Valley Lumber they purchased one hundred and fifty acres to give access to Drag Lake, one of the larger lakes in Haliburton. 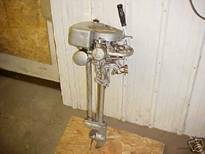 They also purchased a fishing cabin on Kennabi from a Mr. Ernie Fee. As soon as school was out in June that following summer my brother Don, Mother (Mom or Mrs. M to most) [see also Mrs M Remembers], J. C. and myself set out for Haliburton. The trip took about four and a half hours. In those days there was no 401 or 115 highways. However, gas was twenty-five cents or less an imperial gallon. The road into Kennabi was a real challenge of bumps, narrow sections with no shoulders and steep hills. Included was a section where the road went straight past the road into Long Lake and a solid rock hill that would never hold gravel. When we stopped at Nelson Webster’s trailer at Mill Valley to get the keys, I noticed most of the mill hands still dressed in good clothes. They had returned from a Saturday night in town. While J. C went to talk to Nelson, I went over to see what was happening at the log barn beside the road. Two men were trying to catch a large sow in a very wet and dirty coral. Several mill hands in white shirts decided to join in the chase to the shouts of others at the rail. The four of them managed to corner the sow and to my astonishment stuck the pig and let it run around, while the blood gushed from its neck. Dad called me back to the car and we proceeded through the mill yard past huge piles of rough-cut lumber. This mill site had been cleared as a farm, hence the old log barn. In those days, stage coaches crossed the Kennaway Road. The road from the mill to the lake was seldom used by anyone let alone a car and it was a real rough ride. The car hit rock bottom a few times. Every time it rained we could not get back up the Holland Lake Hill in the car and had to get a tow from someone at the mill. The rainwater from the open mill would drain off and run down the hill for two or three days. Finally, Webster’s son, who ran the bulldozer, cut a new road on higher ground about one hundred yards to the right of the old road. The fish cabin was a well built, one room cabin with sawdust and lime between the walls for insulation, a wood stove for heat, with the stove pipe running the length of the vaulted ceiling. On the back was a small addition with a wood cook stove. In front of the cabin was a dock and under the cabin a boat on rollers. We had no running water, no electricity, no propane, no refrigeration and no phone. For light we had a Coleman lantern and for refrigeration, J.C installed a large crock-pot in a spring beside the road. It was about a mile back toward the mill. Every meal meant a trip out to get the perishables and a trip back after the meal. As the cabin was only one room, It wasn’t long before Don and I found ourselves sleeping in a tent behind the then kitchen. We had a wood floor and wooden side walls, with an orange crate to put our belongings in. This was our summer bedroom for two summers. During that time I can’t ever recall that we had a problem with either the mosquitoes or the black flies. 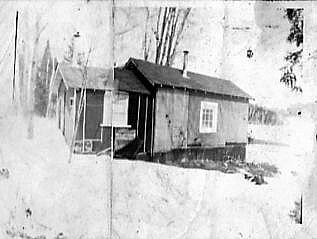 When the lumber camp closed Don and I pulled apart the camp dining hall because it was too large to move. We built the J.C cabin on the hill as our cabin. We only got to sleep there for two years when J.C moved us to the staff cabin in the swamp and moved into our cabin to get away from all the disturbances of everyone at the main cabin. The main cabin had an addition with a fireplace and was a never-ending meeting place. That first year we only had a few camp committee and scouters from the Toronto Office. The mill had two years to timber and were logging around Kennabi and pulling log booms up to the end of the lake with a two-inch thick plank boat and a Johnson OK out-board to pull the logs. It was this boat and motor that we used to move the two troops into camp the second year. In those first years there were many Rovers who came to help and lived in tents on Rover Hill, which was behind the storage building. They came and went on weekends and on their vacation time, paid their own way and even fed themselves. They were all willing workers who made a great contribution to Kennabi. 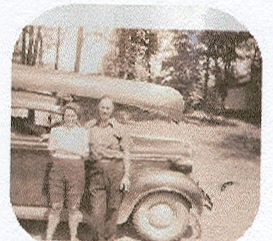 The office or J.C. located two army trucks and, in 1948, Ken Woods (48) and J.C. drove the trucks from Toronto to camp. One had a license to go to town for supplies. Ken Woods (48) and Walt Barnes (48) were the two paid staff at camp. I drove boats and motors all types and the army truck all over the property. When I turned sixteen, I drove the army truck into Haliburton with J.C. for my driver’s test. I parked the truck in the angle parking in front of the barbershop. As soon as the barber was free he came out to give me my test. I backed out of the spot, drove around the then working train station and back to the barber shop. With that he handed me my chauffeurs license. I could now drive the big Hertz 5 ton truck into town. Not only did I learn to drive at camp but safe boating, swimming and building skills. I learned many personal skills and how to survive and get along with people. It was an experience that has lasted me a lifetime.